The Valley of the Radovna River is definitely one of the most beautiful Slovenian alpine valleys.Two glacial valleys of Kot and Krma lead into Radovna. 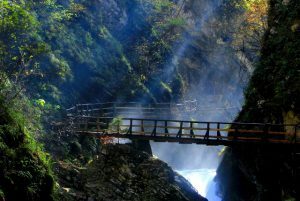 The area is a part of Triglav National Park, which is partially limiting the development of mass tourism. Due to its beauty it is visited mostly by »the conquerors of the useless world«, longing for peace and fresh air. The Radovna Valley is surrounded by the Mežaklja and Pokljuka plateau. Both plateaus are covered by mixed forests, the dominant tree species being a spruce (Picea abies). The Radovna River has several springs under Jutrova skala in Zgornja Radovna ( the largest settlement in the valley), it is barely 17 km long and flows into Sava Dolinka near Moste. 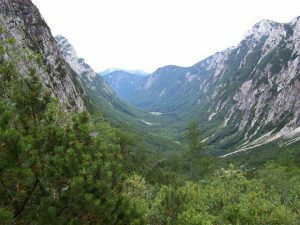 Water mostly comes from the Triglav mountain ranges, where Kotarica and Krmarica with their tributaries otherwise disappear undreground and come out as the Radovna River. One of the most imposing parts of the valley is s wild 1,6 km long Vintgar Gorge, where the Radovna River has found its way between the peaks Hom and Boršt. The cycleway runs along the Radovna valley from Krnica near Zgornje Gorje to the Pocar Farm Museum at Zgornja Radovna. Along the route over 10 information boards have been placed providing visitors with description of the valley and its points of interest. The route is very popular with its beautifull and untouched nature.